Lola was crippled and wasn’t going anywhere. I looked her over, wondering how to get her out of the woods. It was 5:25pm and the sun was setting, the winds were picking up, and the temperature was dropping. The situation didn’t look good: I would need to abandon Lola and begin walking the 15 miles back into town. It was going to be a long night. Lola is, in fact, my car. 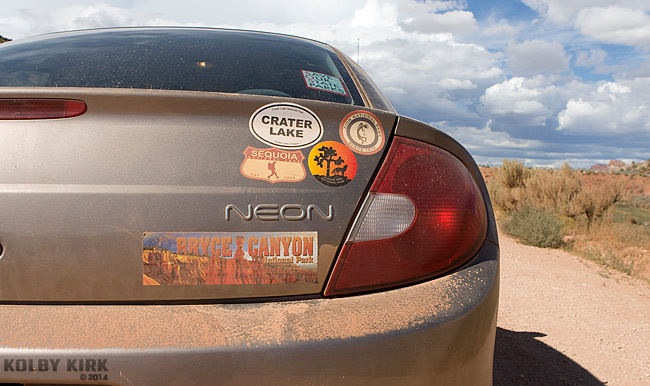 The 2001 “salmon” colored Dodge Neon was given to me by my grandmother, Lola, in 2008 and has since taken me down gnarly roads in California, Utah, and Oregon. She doesn’t look like much of an off-road vehicle, but has been able to get me to places that most other two-wheel drive vehicles probably couldn’t. (Or shouldn’t.) I’ve scraped the belly of Lola on more jutting rocks, crunchy snow, and unfortunately-rooted brush more times than I can remember, but this was the first time she got stuck in mud. My first mistake was that I was in a hurry. I was driving on forest roads south of Bend, Oregon. The further south I went, the higher in elevation and the more obstacles of snow, ice, mud, and water I had to navigate. But I was determined to get out to a small unnamed butte and film a timelapse of the rolling clouds and setting sun. I passed a high-clearance 4×4 pick-up truck exiting the woods. I waved and briefly made eye contact with the driver. He had a shocked expression as I passed, the “I-cannot-believe-you’re-taking-that-out-on-this-road” look. Lola and I have seen that look before. I continued down the road at 35MPH, the 4-foot ridge of ice left between the tire tracks barely missing Lola’s undercarriage. The sun was less than an hour from setting. I made my last turn onto a road simply called “FS-850.” At the intersection, my car broke through the 5-inch layer of ice covering the muddy road like a barge navigating the Arctic Ocean. I turned a bend at 20 mph and saw down the old double-track road ahead. I imagine that it has been close to 80 years since this road saw much action, most likely made by the forestry department for logging access. The road sat low in the woods, a slight drop of one to two feet from the pine trees, manzanita, and rabbitbrush on either side of it. The two inches of snow that fell on Friday night had melted quickly, turning the road into a mess of water, mud, and exposed lava rock. It was about this time that I realized I made a huge mistake. 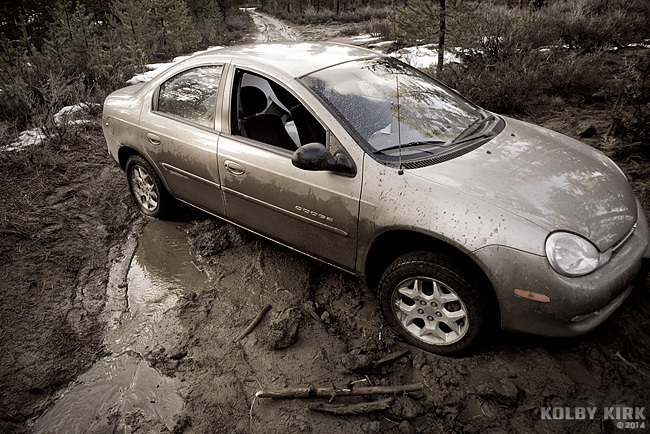 If I slowed down, my car would settle into the thick mud. If I continued on, I’d most likely get into more trouble. The trip down this road had become the equivalent of Chinese finger cuffs. I was going to get stuck, it was just a matter of how much. I drove over a section of road that had a concentration of exposed lava rock and stopped the car. The road ahead offered no exits on either side to turn around. I threw the car in reverse and attempted a y-turn. My back wheels rose up onto the soft embankment, then slid off with a loud “THUNK.” I revved the engine and Lola’s front wheels spun in place. When I got out to assess the problem, my boots sank into the soft mud. Lola after being freed from the deep Arizona sands. 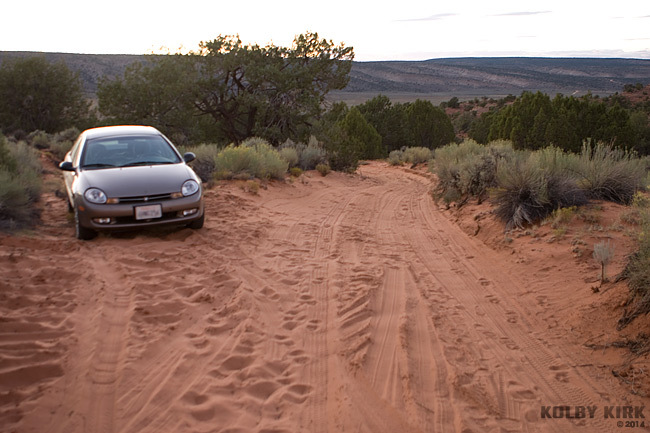 This wasn’t the first time Lola had been stuck on an off-road trip. While trying to reach South Coyote Buttes, Lola sank into the deep northern Arizona sands (but not until after navigating 18 miles of washed out desert road). To get her out, I shoved branches beneath the tires and let some of the air out to gain traction. Why couldn’t that work here? I grabbed some sticks and tore off a branch or two from a nearby pine tree. Using a long stick, I jammed them into the muddy water behind my front tires. Mud sprayed my face and shirt. I tried to reverse again but the tires just spun mud up into the air and onto my hood. It was as I was inspecting my car again that I noticed the large lava rock under the rear door, propping my car off of the ground. Well, that explains the “THUNK” I heard earlier. It also explains why my tires were spinning and I just made it worse by letting the air out of my tires. Unless I gained superhuman strength or Yoda-like abilities to move vehicles with my mind, Lola wasn’t going anywhere tonight. It was 5:25pm. You can see the mess I’m in. Note the big rock underneath my passenger door. Oops. I sat in my car and thought out my options. Before I left town, I sent my girlfriend a message and a topo map. “I’m off to hike Butte 5277 solo, a very easy cinder cone in the middle of this map. Should be home around 8pm. If I’m not, come look for me.” I brought with me the essentials, as I always do: snacks, 2 liters of water, gloves, a warm hat, a lightweight scarf, a puffy jacket and a rain jacket, a pocket knife, a headlamp and an extra light source, a lighter, and my GPS. I was wearing water-resistant boots, two layers of socks, quick-dry clothing (pants, base-layering, and long-sleeve shirt). I looked at my iPhone: No cell service available. It had just 16% battery life left, so I immediately turned down the brightness level and activated airplane mode to conserve the battery. I wrote out a note with the date/time, my name and phone number, and explained that my car was stuck and I was walking back towards Bend. I looked through my phone’s contacts and included on the note the full names and phone numbers of my girlfriend and housemate. I sealed the note in a zip lock bag to protect it from the elements and placed it under my windshield wiper. Fortunately, I was very familiar with the area having spent the last 18 months carefully mapping out the surrounding buttes for my upcoming book, Hike Your Butte Off! My plan was to hike a quarter of a mile northeast to Kelsey Butte where I could gain enough elevation to get cell service and call a friend to come pick me up. I locked the car and began hiking directly towards the butte, crashing through the bushes and snow, tree branches and leafless brush grabbing at my clothing. When people become lost in the woods, their first instinct is to hurry up. I wasn’t lost, but I could feel the adrenaline pushing me forward, causing me to make careless steps that could lead to injury. I stopped frequently to remind myself to stay calm and to take it easy. I climbed Bessie Butte high enough to see the city lights of Bend in the distance. I took out my phone and turned it on. To my horror, I watched the battery life flash 16%, then 1%, then began to shut down. My only means of communicating with the outside world just died in my hands. I stood on the flank of the butte for a moment, concentrating on staying calm by watching the sun set behind a wall of cumulus clouds. It would’ve made a nice timelapse, I thought. I hiked back to Lola hoping to charge my phone, but discovered to my dismay that my car charger was not there. My chin hit my chest when I remembered removing the charger just two days prior. So I sat in the car and tried to think of my next plan of action. I could wait for a rescue, figuring that my girlfriend would start to get worried around 8pm (in two hours) when I hadn’t checked in. She would hopefully contact a friend or possibly the Deschutes County Search & Rescue to report me as missing, who would then try to find me using the topo map I had provided her. It was probably not going to be until early tomorrow at first light that I’d have someone start looking for me. I had a sleeping bag in my trunk and enough gas to keep the car warm. But I felt it would be less of a hassle for me and the search party to simply walk out of the woods, sticking to the forest roads. I turned to look at Lola one last time, then began the long hike through the dusk. It was 6:30pm. The hike out of the woods reminded me of the long hikes I’ve done. I had hiked nearly 4,000 miles in the past six years, which included a five-month stint on the Pacific Crest Trail where I hiked from the Mexican border to about the California-Oregon border. I was comfortable hiking in the woods in any type of weather or time of day. It had been a while since I’ve done a long trek, but I felt confident that I had the ability to travel the 15 miles or so to the edge of town on foot. While hiking, I frequently looked up at the dark night sky. The Milky Way stretched across the sky like a contrail, stars twinkled through the occasional cloud. The wind bent the tops of the trees. To the west, the crescent moon was enveloped by an incoming storm. I recalled the weather forecast before heading out: 80% chance of rain after 4am. Wind gusts up to 20-25 MPH. Temperatures expected to drop below freezing. I picked up my pace. After five miles, I reached China Hat Road where I had a better chance to flag down a motorist. The road is the main artery into this section of woods, but has little traffic this time of night. After another 2.5 miles, my long shadow told me a vehicle was approaching! I turned and waved my hiking poles in the air, nearly standing in the middle of the road. At first, the truck maintained its speed. “Oh, c’mon!” I mumbled under my breath. Maybe they were afraid to pick up a large bearded man walking out of the woods? But after 100 feet, the truck’s red brake lights illuminated the forest, then the reverse lights. “Need some help?” I would be home by 8:30pm. Once home, I ran to my computer to let my girlfriend know I was home safe. She was indeed worried about me but had no idea what to do with the map I sent her – and rightly so: It had not a single street name, feature name or label that would identify where I had gone. It could have been a topo map of Iceland for all anyone could guess. Next time, I’ll have to give her a better map and more detailed instructions of what to do. Hopefully, there won’t be a next time. The rescue! The day after I walked out of the woods, friends joined me to help extract my car. We first concentrated on destroying the rock that held my car up. When that didn’t work, my friend grabbed a fallen tree and used it to pry my car off of the rock. The prying plus the pulling from my friend in the jeep finally dislodged Lola from the muddy mess.